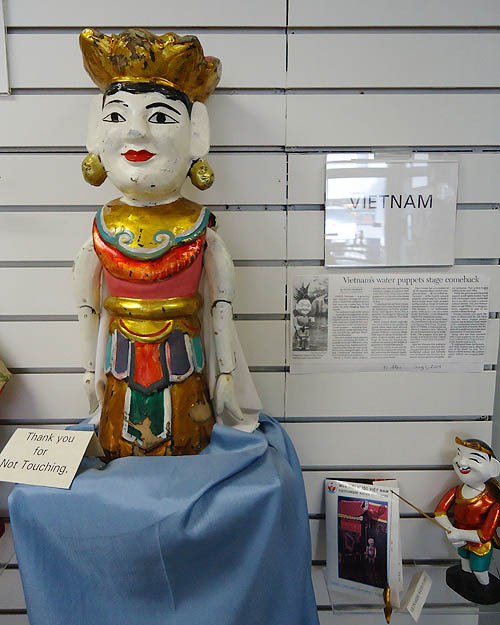 Puppetry Arts Institute is the only museum dedicated to Hazelle Rollins and her puppets. 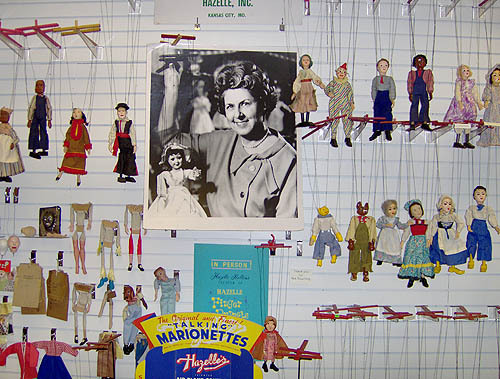 Hazelle was a Kansas City area businesswoman who created Hazelle, Inc. the internationally recognized puppet factory in Kansas City, Missouri, from 1934-1985. Our Hazelle exhibit features examples of her hand puppets, marionettes, as well as manufacturing parts from her factory. Our tour shares Hazelle’s story, and showcases her signature marionette and hand puppet styles. This room is dedicated to our founder and late Executive Director Diane Houk. Examples of many types of puppetry, from all over the world, are exhibited here, and visitors can view their unique craftsmanship and performance styles. Tuesday – Saturday 10:00 am to 4:00 pm. 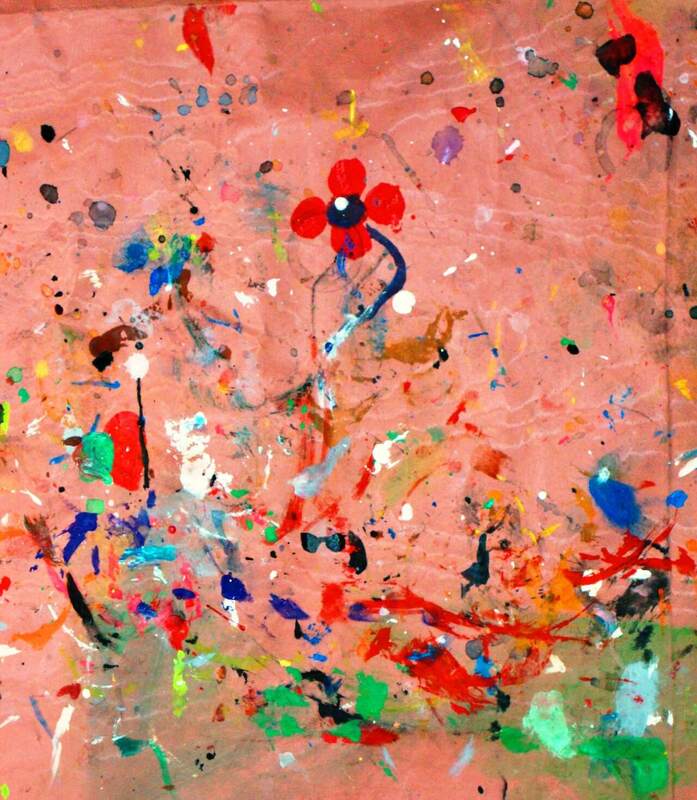 If desiring a guided tour, please schedule 45 minutes before closing. Price of admission includes a tour of Puppetry Arts Institute, the Hazelle Rollins Room, Diane Houk International Room, and our featured exhibits. Students 16 and under – $1.50. Contact us at 816-833-9777 or by email at pai@att.net for tour scheduling. The Puppetry Arts Institute was founded by the late Executive Director Diane Houk and opened in 2001. Diane’s husband Edward Thomas (E.T.) was a construction engineer and they worked and lived across the globe for many years. As an avid promoter of puppetry since a child, Diane collected diverse puppets from the many countries she lived in. After returning to Independence Missouri, Diane became an active member of The Puppetry Guild of Kansas City Diane was always a fan of business woman Hazelle Hedges Rollins who created the world’s largest toy puppet factory in Kansas City. Hazelle Inc. was in production from 1934 to 1975. After the factory was closed by Hazelle, it was sold and run by several business owners. However, none could maintain the finely tuned company partnership developed over the decades by Hazelle and her staff. Unable to find a buyer for the business, the final owner donated all the physical assets to the Helping Hand of Goodwill Industries in Kansas City. 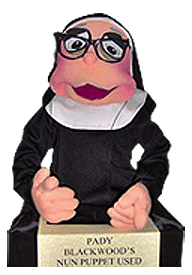 In 1991, Goodwill Industries offered the unused remaining inventory to the Puppetry Guild of Kansas City and the Hazelle Puppet Project was formed. The project was designed to stimulate local puppetry and exhibit the work of Hazelle. This project developed into a vision by Diane to create a permanent site for the factory inventory as well as a museum and puppet related venue. Through fund raising, community support, and volunteer board member efforts, her dream came true. 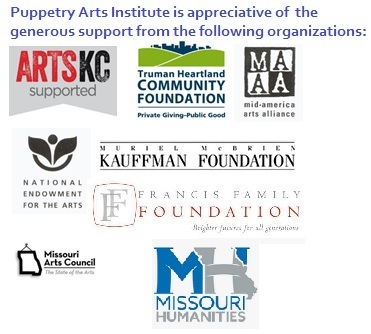 The official Puppetry Arts Institute was created with the mission to: “preserve and promote puppetry through education and entertainment for all ages”. The mission continues on as PAI offers a museum room showcasing the Hazelle Inc. factory history, The Houk International Collection, rotating puppet exhibits, a multi- purpose workshop -performance space, a puppet research library, and a gift shop of unique puppet related items.